Halloween is right around the corner! Most kids can't wait to don their costumes and make their way through the neighborhood, but for children with sensory sensitivities like those associated with ADHD, Asperger Syndrome, and Sensory Processing Disorder, Halloween can be stressful. At Brain Balance, we want all children to enjoy Halloween, including those with learning and behavioral disorders. With some careful planning and preparation, children with sensory issues and other special needs can enjoy this exciting time of year as well! 1. Give your child a schedule of events for special activities, particularly on days with lots of transitions. Whether it's a written schedule or one with pictures for younger kids, your child will feel calmer and safer knowing what is coming up. Discuss the schedule regularly and provide info for each event. For example, let your child know which events will take place outside and which will be loud or crowded. Sometimes just knowing what's next can help children with extra needs feel less anxiety. 2. Have a code word your child can use if he or she feels overwhelmed and needs a break. Honor the code word by removing your child from the stressful situation for a few moments, and discuss coping skills. Again, giving children some control during activities that may be overstimulating will reduce anxiety and enhance the fun. 3. Before you leave for Halloween parties, parades, or other fun events, have a quick family meeting so that your whole family knows how long you plan to stay and how you expect them to behave. This will benefit neuro-typical children as well, since any child can get overwhelmed with the excitement of Halloween. 4. 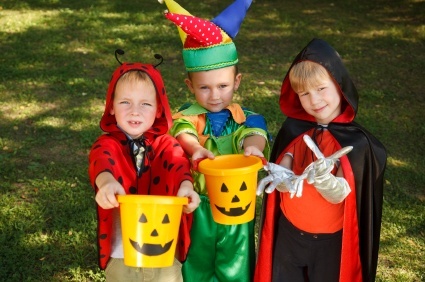 Children with significant sensory sensitives should practice wearing their costumes BEFORE an event. This will allow you to get rid of itchy tags or scratchy fabric ahead of time and prevent sensory meltdowns. Bring along a soft Halloween-themed outfit or other favorite outfit for your child to wear if he or she can no longer tolerate the costume. 5. If your children have food sensitives or allergies that prevent them from eating their candy, plan ahead to offer alternatives like toys or all-natural candy. If you aren't sure what to offer your child, ask them! Most children will be glad to make a trade for something they really want. Halloween doesn't have to be a stressful time for a child with sensory issues! We hope these tips help your whole family enjoy this fun time of year. Want to know more about how The Brain Balance Program® helps children with learning and behavioral disorders reach their physical, social, and emotional potential? Contact us today! Valentine Treat Alternatives that Kids Will Love!